I designed an apartment for a young couple who moved to Manhattan from Chicago. They needed to downsize and struggled with the size of their new abode. The apartment had great bones and I wanted to highlight those features. I designed their living room and was able to fit more than they thought they had room for. Designwise, this was a very neutral design with shades of whites, greys, blush supported with tons of layers, scale, textures and art to bring the overall pop. I created a California comfortable design with linens, washed woods, brass, cane and a lot of tone on tone. Photography by Daniel Wang. Neutral mood with layers of whites, grey, and natural woods. As always, I started with the layout and managed to fit a larger sofa than the clients thought we could fit. Every cushion, the play with the sizes and material, the color and pattern, the throw is a well thought out design decision. The art installed vertically between teh two windows and the vases with the cherry blossoms are unique design features that play up the exsiting bones of the apartment. A diverse material mix with linen, cane, natural wood, glass, shagreen and brass make this living room design. The media console with the cane texture is beautiful and really makes a strong statement. The accessories are on point. The art and the vases continue to make a moment I love!!! Another moment of luxe style. 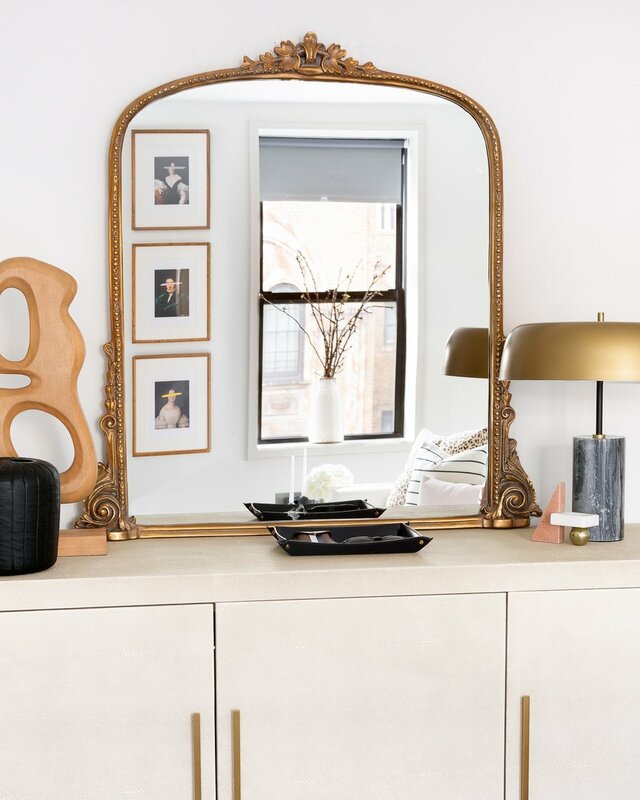 Sideboard in bone shagreen with brass hardware adorned with a beautiful antique mirror atop reflecting that beautiful art and those windows…. you know I love them by now!! The assymetric lamp with a marble base and brass shade adds a modern charisma to it. Styling shot of this beautiful textural moment. Natural Cane with matte black modern legs; Nero marquina and carrara spheres in a wooden bowl. Coffee table books for days and those gorgeous white textured hurricanes and succulents.